Though they’ve been around since 1984, KMFDM surprisingly has only had a few remix EPs and no full length remix albums. But with Brimborium, all of that is about to change. Offering 12 tracks that serve as a remix to last year’s Tohuvabohu, this release offers quite a few big names off of the Metropolis label but as with most remix albums this one’s going to be best listened to by those who loved the original album that inspired it rather than newcomers. The reason that I say this is that while a few of the artists take the existing tracks and make them their own (which sometimes means that these new versions are better than their original counterparts), too many of the remixes feel too close to the versions made solely by KMFDM. Remixes should offer new interpretations of the originals, rather than just messing around with a few riffs or taking a few things out here and there, and in this regard some of the material on Brimborium is very disappointing. Highlights do include the Die Krupps remix though, so if you can do so I’d recommend buying a few of these remixes separately and skipping out on the rest. 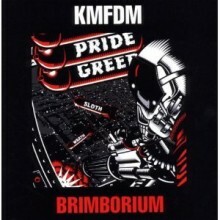 Brimborium isn’t terrible, but its quickly become evident why KMFDM has only had remix EPs rather than full length remix albums for their many years of existence. There are enough notable remixes on here for fans of the band and its Metropolis label mates to warrant a listen, but casual fans of Tohuvabohu are more than likely to find this release too close to its counterpart and therefore not worthy of a purchase. Overall, if you’re a diehard KMFDM listener you’ll want this one, otherwise it would be recommended to wait until the band has new material (which if it follows their current release pattern could be sometime in 2009). KMFDM to Reissue “Opium” and “WWIII” Albums on 10/22… On Tour!